If those are indeed Dino's which they appear to be -- it is a long tough battle. No chemicals on the market will treat it. Chemicals only make the situation worse causing so many other issues throwing the eco system out of balance. The only treatment that seems to make a dent is elevating N03 & P04 levels along with pulling out your sand bed. A UV works depending on which strain of dino you have. Imo, that’s absolutly true except i kept my sandbed. Gone in about 2 weeks. DinoX seems to be hit n miss depending on strain. Guys I need some advise; I'm thinking about adding more cuc like some snails. I have a lot of denitrus buil-up every couple of days on my rocks that I think maybe adding fuel for the dino"s. But after fighting almost a year with dino's my water has seen dinoX, phycoEx, dinoxal, H2O2 and I didn't do a water change for months, I'm afraid this wil fuel more dino's. Has my water become dangerous to snails or other micro-fauna? I have GFO bags in the water for a couple of weeks now, does this remove al the toxins from the dino's and dino-treatments? Thanks for the help! GFO will remove phosphate and silicate, but it won't remove much in the way of organics. Some fresh carbon will help remove organics. You might need several batches, if there's a lot of organic content in the water. Unfortunately, we have no practical way to measure that parameter. When you say "detritus" do you mean leftover food and the like, or some sort of microbial growth? I'd probably do a few water changes, although they might fuel a bit of growth, to keep the ionic balance in line. I believe I have ostreopsis dinos. They are primarily on the sand bed but I've lost two acropora. I started running carbon and vacuumed the sand every night. Po3 was 10 and Po4 was .1 They kept coming back every day for about a week. I bought a UV Sterilizer and it had an immediate impact. It didn't get rid of the problem but slowed it down so I only have to siphon about every third day. Not sure where to go from here but I might try adjusting the flow rate on the UV sterilizer then give it some time to see where the tank goes. Hi. 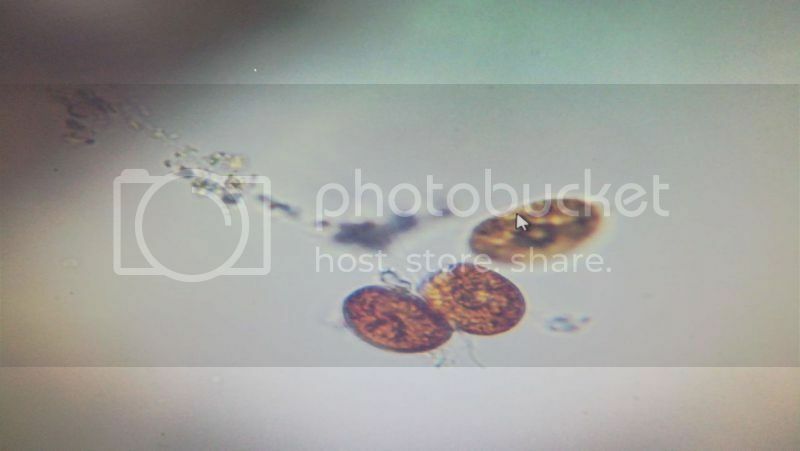 I'm having brown "dusty" cyanobacteria, diatom or dinoflagellates. It seems to me now that it is dinoflagellates. Here's a couple of pics of how they look under the microscope. Can you help he ID it? I'm guessing ostreopsis, they look similar to mine. Do they move around a center point? Yes, they do. Do you know how can I control them ? I'm using a UV sterilizer right now which is somewhat effective but hasn't eliminated the problem yet. I've only been running it about a week. I had dinos for months. I used dino-x everyday until it was gone. Turned off UV for several hours after dosing. Dino-x instructions state you should dose every 48-72 hours, I can't remember off the top of my head which is correct. I however, dosed every night until the dinos was gone. I've been dino free for the last several months. I also made sure to sterilizer all equipment that was used on the tank but was not part of the in-tank treatment. I'd also like to add that my dinos was really bad, covering all surfaces and smothering/killing my corals. That's why I said F it and dosed every single night and at a higher than recommended dosing strength. I agree that they likely are dinoflagellates. That makes sense, given the symptoms. You could try Dino-X. I am not sure that any animal is likely to help. the grooves at the "front" outline a tongue or nose like projection (epicone) that is the best indicator of amphidinium. Tarisha thinks it is Amphidinium and not Ostreopsis, and after more detailed observation, I agree. It really looks like Amphidinium. Also wanted to share that raising PO4 to 0.07ppm and NO3 to 0.25 this week and siphoning out the brown dust "amphidinium" that I had on the sandbed, seems to be working. It is returning at a much slower pace than before and I hope that I can win this by sustaining the PO4 and NO3 at those values and siphoning out any sign of brown dust when doing my weekly water changes. I'm glad you're making some progress! The dinos are very reduced, but I can still see some remanent on the sandbed. PO4 = 0.1 and NO3 = 1.0. I started to see some green algae on the rock, which is consistent with raising PO4 and NO3. KH = 8.1dKH. An unexpected situation happened. A relatively large montipora capricornis colony that I had, which was growing very well and looked very beautiful (bright red, with visible polyps) for about year; died suddenly. One day it was beautiful, the other all its tissue was melted-brown slimy. Frags that I had of that same monti cap on the other side of the same tank, are also dying. Luckily, I have some frags in my other system that I can eventually bring back to this tank. 1. Could the dinoflagellates be related to this? 2. I introduced a new Montipora Capricornis, very similar to this one that died (red), but with yellow polyps. I have seen it called "Starburst Montipora", Tyree Starburst or Starburst Cap. That frag seems to be doing OK. Can it be related, perhaps chemical warfare (allelopathy) between Montipora Capricornis species? How can this be so specific to just the montipora capricornis (large colony and small frags) and not other corals in the tank? And how can it happen so suddenly, one day all good, the other all dead? Dino's are virtually gone. Small spot here or there but those are going away too. I don't have to siphon the sand at all anymore. Once everything is clear I'm going to turn off the UV and see what happens. I'm using a 25W UV on a 40 gallon breeder. Dino X worked for me after 4 treatments with reduced light period. Blues only for 4 hours per day during treatment. No casualties. Still Dino free, still no casualties. I will keep the thread updated. Didn't you describe a brown blob-like infection that would show up when an sps got a cut? It sounds like you have brown jelly disease in your system. 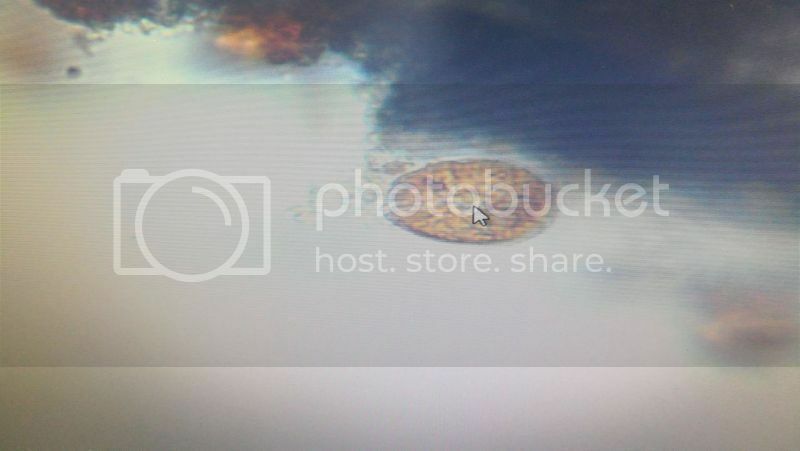 Throw some of the brown melted slimy tissue under the microscope. Hi Taricha. Yes, I had some incidents with Euphillia LPS (not SPS), which seemed consistent with brown jelly disease. Overall, my Euphillia (hammer and frogspawn - has not occurred with Torch) seem very delicate -- specially hammer. The recent incident was with Montipora Capricornis (SPS), which was doing great for a year or so. I gave away many frags, it had amazing growth and color was bright red. Then one day it just suddenly died (skin becoming brown death melted stuff). It is too late to take a sample of the brown stuff, but will keep in mind taking a sample next time I see any brown stuff like that in my tank. Do you think it can be the same "brown jelly disease" that attacks euphillia, that now attacked the monti cap? Does it stay in the tank forever latent? How can I get rid of it? Is it dinos? Yes, it can. Brown jelly disease is now understood to be a community of organisms - bacteria, ciliates etc. that work together to degrade the coral tissue. The ciliates zooming around eating the zooxanthellae looks CRAZY under the scope. I personally believe it's possible there's a minor effect with the frequencies of LEDs being more selective than MH were, and perhaps MH supported more dino competitors than LED fixtures. But It's more likely that other things have changed about your tank care since MH that make a bigger difference. Thanks Tarisha, how can I treat the tank? How to do a profilaxis and mitigate the possibility of having the conditions for brown jelly? Is this like Dinos that you don’t eliminate them, but take actions to maintain a healthy balance of micro fauna, bacteria and algae? The dinoflagellate issue has improved (reduced) since I increased nutrients (NO3 1.25 and PO4 0.1 most recent measures). I also introduced some copepods from a friends sump and they seem to be reproducing quickly. I noticed that the dinos are now only growing (or most noticeably) on the sandbed under the shade of an euphyllia torch coral. I'm finally winning the battle (knock on wood) after the most agonizing battle I've had in 30+ years of reefing! Took me to the brink of throwing in the towel. After trying everything under the sun, the only thing that had any real impact was to raise P04 from zero to .1 & N03 from zero to 5-10 respectively. Running those two elements at zero was most definitely the cause of the disaster. I've never been so happy to see green again! Here's a few pics of what's left... now to rebuild!